Black America's Political Awareness; Beto O’Rourke visits Prairie View A&M University. You are here: Home / Misc. 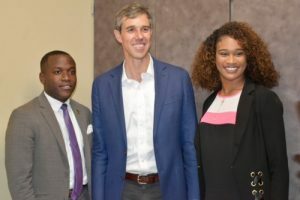 / Education / Black America’s Political Awareness; Beto O’Rourke visits Prairie View A&M University. Black America’s Political Awareness; Beto O’Rourke visits Prairie View A&M University. (ThyBlackMan.com) When I heard Beto O’Rourke was coming to the Prairie View A&M University campus to hold a “town hall” meeting, I immediately checked my schedule to see what prior commitments I would be escaping to ensure that I was in the house. It was only after realizing that September 19th was a Wednesday that an unavoidable reality emerged. There was no way that I would be able to attend what many around me were terming a “can’t miss event.” I mused that maybe the God’s were working against me as every Wednesday I co-host two blog talk radio shows that sit near the top of my standing commitments. Although I could not be present when Beto O’Rourke spoke, I found great comfort in knowing that many of my students would be in attendance. I planned to rely on them for a blow-by-blow account of what occurred. I soon found that the most reverberating comment was the following. I am confident that my response of “He was most certainly seeking to use you for your vote” startled my students. I hoped that the subsequent statement of “So if you realize that someone is seeking to exploit you for your vote, the next question you must answer is what type of ransom are you demanding for your vote?” alleviated their uncertainty. Why does Black America — at both the local, state, and national level — not have a list of political demands prepared before political seasons arrive? Why do black voters not see an incredible opportunity when politicians appear for the sole purpose of securing their vote? After all of these years, why has black politicization remained so low? Who is responsible for this disgrace? Who benefits from the pervasive political illiteracy of Black America? When will blacks understand that political diversity is acceptable as long as we agree that the ultimate goal of our activism revolves around the uplifting of Black America? Although rarely mentioned in the public arena, during the last fifty-years Black America has often been its worst enemy in regards to the mobilization and execution of political gains. A cursory examination of the American historical record indicates that when organized and motivated, Black America has proven to be a significant factor in local, state, and national elections. The election of the following figures attests to this point. However, when disorganized and unmotivated, Black America wallows in a putrid political indifference that reverses hard-fought gains in a criminal manner. When one examines the fickle nature of Black America’s political participation, the only words that come to mind are political immaturity, inconsistency, and pervasive illiteracy regarding why voting matters. Instead of accepting the reality that savvy use of political collectivism is the only path to politico-economic empowerment, Black America continues to rely on a scatter-brained leadership cadre with little understanding of the time needed to prepare black voters for voting day. While other groups are led by political leaders who study the successes and failures of others, black leaders continue to behave as if the entire process is a mystery. One has to wonder how individuals who have held political positions for decades could be bewildered by what should be familiar political environs. I pray that my students and other segments of Black America one day understand Frederick Douglass’ admonishment that “power concedes nothing without a demand. It never has and it never will!!!!! !” The question facing Black America at the present moment is as the mid-term elections rapidly approach are we as a community mature enough to issue the demands that Douglass references. One thing is certain. If Black America proves yet again that it is unprepared to issue what can be best termed “reasonable political demands,” there is not a single politician capable of discerning their needs, let alone delivering on them.